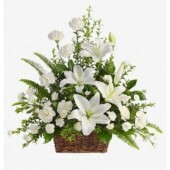 Send your profound sorrow message with funeral flowers and comforting gifts. Sometimes it is hard to find encouraging words when the one you care are in difficult time. 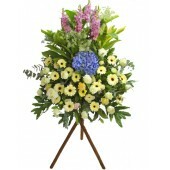 Send your profound message of sorrow with flowers and sympathy gifts to let them know you care them. In case you would like to get a customized message then you can visit our online shop to get your sympathy gift order prepared for you by our local florist in Hong Kong. Rest in Peace, a bunch of sympathy flowers with ten carnations in white color and six gerberas in wh.. 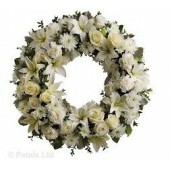 Celebrate someone's life and remember the happy days together with this bright wreath of white f..
Offer your condolences in a most memorable way and show that you will never forget with this peacefu.. Sympathy Flowers arrangement with Sun Flowers, Lillies, White Color Gerberas, White Color Roses .. 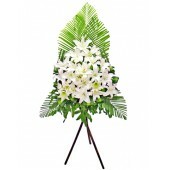 Sympathy flowers arrangement with Yellow lillies, white color Gerberas, Lillies, green palm leaves a..
Rest in Peace Sympathy flowers arrangement with Yellow lillies, white color Gerberas, Lillies, green..
A pretty funeral arrangement of white gerberas, white roses , white lily and greeny ..